The Melvins have a new album out today on Ipecac Records! 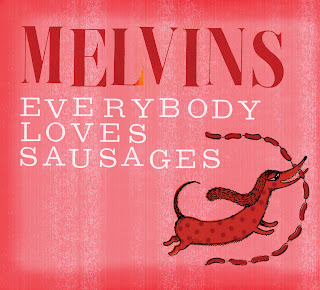 It's called Everybody Loves Sausage, and it is an album of covers. The songs are all from the late 70's and early 80's, clearly a personal nod to their influence. Everybody Loves Sausage sees The Melvins in various stages of undress: with guest vocalists, sometimes with Big Business, sometimes with Trevor Dunn, and even a track with former bassist Kevin Rutmanis. It kicks off with Venom's Warhead, and who better to sing it than Scott Kelly from Neurosis? No one. After that comes a surprisingly major key tune: Queen's You're My Best Friend, which the updated production makes come off as one of Ween's more pleasantly polished songs. Black Betty features the Melvins' lineup with members of Big Business. It is an old work song, though the Melvins seem to be paying tribute to Ram Jam's rendition. I must admit I previously only knew the Leadbelly version, though the Ram Jam one is great too. Set It On Fire, Attitude, and Station to Station are fairly close to the original, though given an inevitable dose of extra heaviness from the Melvins update. That heaviness, somewhat lacking in the Kinks original, makes Attitude one of my favorites on the album. Female Trouble features a deep groove by Trevor Dunn on the upright bass. Translated from the 70's funk of the original, the song gives Buzzo's growl a cool Tom Waits-esque context to wallow in. Their cover of the Fugs' Carpe Diem captures something of the spirit of the song that seemed drowned in the relatively low-fi production of the original. Vaguely recalling the Beach Boys (but with more aggro interjections), this version recalls a hypothetical Mike Patton production. Tales of Terror's Romance also features Buzz on vocals. Along with Black Betty, it's chord progression sound the most like an Melvins song. Tom Hazelmyer (of Amphetamine Reptile Records) sings The Jam's Art School. His voice is gutteral and intimidating, giving the song a new degree of believable menace. The final track, Heathen Earth, seems at first like an album filler, but once you realize it's a Throbbing Gristle tune, it is all OK.
As a cover album of 70's/80's rock, I was reminded at times of Slayer's Undisputed Attitude. As an album featuring lots of guest musicians, I was reminded of Jay-Z's The Dynasty or The Melvins' own Crybaby. Of course, any album of covers depends on the song selection and the interpretation, and the Melvins found a solid lineup of collaborators to shine in both areas. On April 23, REDCAT presented music by Christian Wolff, one of Experimental Music Proper's most influential living composers. The second half of a two-night series of concerts, this show was lead by Wandelweiser-er Michael Pisaro, who has done much to extend the direct lineage of the American experimental tradition in Los Angeles. The concert began with You Blew It, from Wolff's Prose Collection (available online for free at Frog Peak Unbound). Two things that are likely to send crowds running are: 1. someone explaining the music beforehand, and 2. audience participation. That Pisaro was able to introduce the audience to the piece and lead them in an all-around enjoyable 3 minute performance is a testament to his experience as an advocate and educator of experimental music. It was also an ample opportunity to draw the attention of neophytes to the game-like structures of many of Wolff's pieces - it is often music for participation, in which the ultimate vantage point is from the performers' perspective, rather than the audience's. In a genre where points of entry can be few and far between, this sort of conceptual dissemination is very important. After You Blew It, regulars from the experimental music community centered around the wulf presented two excerpts from John Heartfield (Peace March 10). The first excerpt featured Casey Anderson on alto sax, Matt Barbier on bass trumpet, Eric KM Clark on violin, James Klopfleisch on upright bass, Kathy Pisaro on english horn, Michael Pisaro on guitar, Cassia Streb on viola, and Christine Tavollaci on bass flute. For the second excerpt, Cassia Streb rhythmically recited the life story of artist John Heartfield over a rhythmic/arhythmic bed of cardboard box percussion, making her probably my favorite Canadian rapper (with James Klopfleisch as her hype man - not Canadian, however). In Trio V for James Tenney, new music piano virtuosi Vicki Ray and Danny Holt played four hands on one piano, joined by percussionist Colton Lytle on a multi-percussion setup. A delightful "unprepared" imitation of a prepared piano, I am particularly curious to see the score for this one (though James Tenney only occasionally wrote for the prepared piano, he had a penchant for performing Sonatas and Interludes. Last July, Hat Hut Records posthumously released a CD of his interpretation). The first half of the concert finished with the Calarts Percussion ensemble doing Fall III. This piece included rhythmic notation, giving the musicians the opportunity to select their own timbres. After intermission, Michael Jon Fink, Brian Walsh, and Andrea Young played For 1, 2 or 3 People. The potential "lesson" learned from the audience participation of You Blew It was most obviously applicable when spectating this seminal piece. Consisting of grouped symbols like the ones at right, it is the performers' role to act and interact cooperatively to realize the given system. All three musicians were sensitive and experienced improvisers, which can make a huge difference in a composition like this. 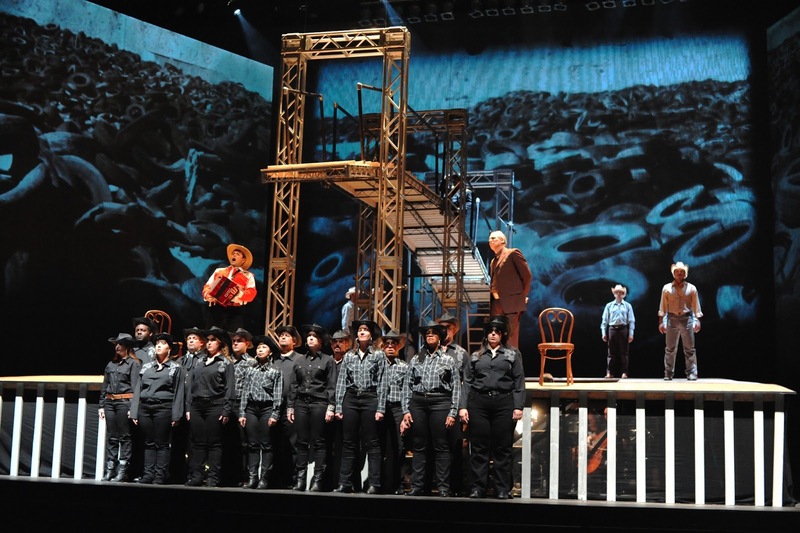 The concert concluded with Changing The System, performed by the same ensemble that played John Heartfield (Peace March 10). Pisaro's program notes state that the piece "might be one of the few successful 'political' pieces of music ever written." I was glad the concert ended on a high note with both lithophonics (musical stones) and floorcore (where musicians sit on the floor). On April 6, Jon Armstrong presented a 24-piece jazz orchestra at the Blue Whale. It was the largest ensemble ever to play in that space, and the robust sound filled every corner. Many of the tunes were originally written for smaller groups, including Slumgum (most of whom were in the band that night). These were refracted through a filter of orchestrational influences, including Vinnie Golia, Quincy Jones, Duke Ellington, and (70's) Miles Davis. Having the palette of an entire 24-piece ensemble will inevitably bring out new dimensions of any composition, transforming it into something new. The lineup of musicians was stellar (see below), and each performer was given a chance in the spotlight. The solos didn't feel like your typical jazz one-upmanship, as each soloist's style was surprisingly distinct and developed. Perhaps this is due to all but a few of the musicians having gone through David Roitstein's jazz program at Calarts. It was a kaleidoscope of voices, and their strategic placement through the music seemed to give each player a moment in their natural element. The solo highlights for me were Gary Fukushima's unaccompanied piano solo in the first tune, the tuba solo by Stefan Kac in the last tune, and some great moments by Gavin Templeton and Clinton Patterson. The compositions fit together through their diversity. 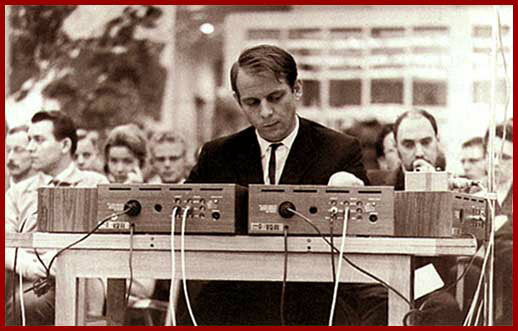 Armstrong took the lead for one ballad, in which close mic'ing allowed you to hear the breath control and shifts of partials. The first tune of the second set reminded me of Pierro Piccioni, but in 7. Another tune featured the whole ensemble playing heavy interlocking patterns and harmelodic unisons, occasionally reminding me of Louis Andriessen's Workers Union. The only "song" of the evening featured vocalise by Joon Lee, owner of The Blue Whale. I wanted the post-ambient intro to continue in suspended animation, as I always do with the third movement of Symphony of Psalms (rehearsal number 22 on...). However, the 6/8 that it transitioned into sounded refreshingly candid with Lee's vocals, the timbre of which one doesn't normally hear in jazz (which made it that much more effective). On March 30 and 31, REDCAT presented their Spring Studio, part of their quarterly series that "give[s] new artists an opportunity to hone their skills and offer[s] established artists a chance to test new material and works-in-progress before an audience." Federico Llach's 11 Points started the program, performed by the Now Hear Ensemble. The quintet played a set of evolving musical cells, following the rhythm of a live ping pong game taking place downstage from the group. It was a compelling take on the role of the modern conductor, as well as the aesthetics of post-minimal music. The pendulum sway of the pulse was hypnotic, adding surprisingly expressive tempo fluxuations. The audience obviously felt the drama of ping-pong spectatorship, cheering and laughing through the piece. My favorite part was whenever someone scored, and the band stopped playing. At that point, their musical phrases were lended cadential variation by the ball bouncing away in the otherwise silent space. This was followed by Kinetic Makeover, by Milka Djordjevich. Starting her solo piece facing away from the audience, Djordjevich stood completely still. She gradually introduced a pendulum-like kinetic motion that was morphed into various physical manifestations, including hip swaying, sliding on the floor, hopping, clapping, and full body gesticulation. Alan Nakagawa's Organ of Corti was next. For this piece, the ushers handed out ear plugs and balloons. The audience members were asked to blow up their respective balloon and hold it in their palms (the earplugs went in their ears...). Nakagawa played an array of electronic instruments and gadgets, accompanying a projected video. If your balloon was blown up enough, you could feel the vibrations from the music in your balloon, making it a tactile as well as an aural experience. For me, this worked best with lower frequencies. After intermission, Wilderness presented Leaves of Grass. This piece centered around a couple's seemingly idyllic relationship. A video of slow moving clouds played above a square of astroturf as the two performers lay in the grass and gazed at the sky. Snippets of pre-recorded conversation played, offering a glimpse into their inner world. While development in this piece was especially nuanced, it was possible to interpret it as an aesthetically pleasant distillation of static theater. Justin Streichman's The Conduit was a neat series of solo theatrical vignettes. Of the influences claimed in the program, the one I could detect the strongest was Andy Kaufman. From the meta-narrative of the opening to the shining house lights at the end, Kaufman's influence was felt. Mecca Vazie Andrews finished the program with Sandra Dee De E. The piece was book-ended by ensemble dances with music by Suicide and Liars, which is a good place to start. However, the strongest part of the piece was in the middle, with Andrews' spoken performance. I wanted to hear more. Applications for REDCAT's summer studio are due this Friday, April 12. I have been helping organize the estate of the late James Tenney, and thought it would be useful to have a Facebook page where relevant performances, events, releases, articles, etc. can be shared online. Thus, allow me to introduce the official James Tenney Facebook page. If you are interested, please Like the James Tenney Facebook Page and we'll do our best to keep you up to date on anything related to the life or work of James Tenney. If you are releasing or presenting something related to Tenney, this is a great place to share it. Feel free to post it on that page, or send me info/links to post. Please note that this is different from the pre-existing "community page." 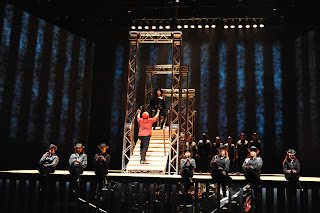 On March 30, I was able to see/hear the Long Beach Opera production of Gabriel Ortiz's Camelia La Tejana: Only The Truth at Long Beach's Terrace Theater. 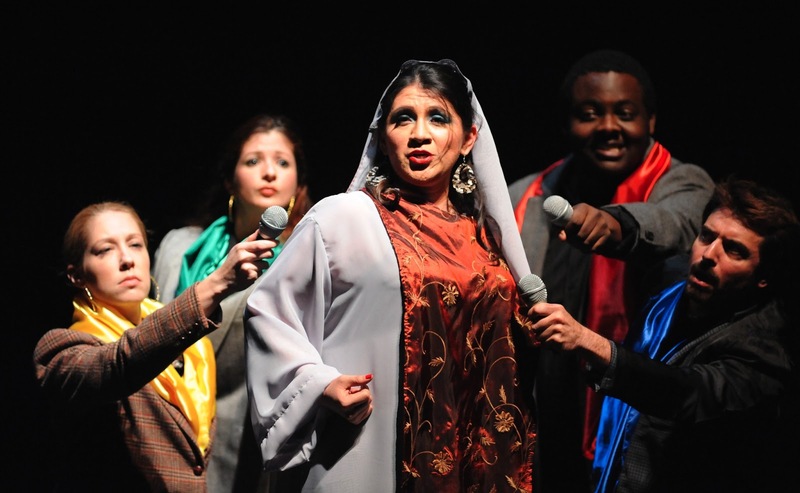 Originally titled ¡Unicamenta la Verdad!, the opera is centered around Camelia La Tejana, a narcocorrido character initially made famous by Los Tigres Del Norte in the song Contrabando y Traicion. The colorful orchestration and prominent rhythmic drive of Ortiz's music brought Silvestre Revueltas to mind, but there were also similarities to Anne LeBaron's Crescent City, which The Industry premiered last spring at Atwater Crossing. 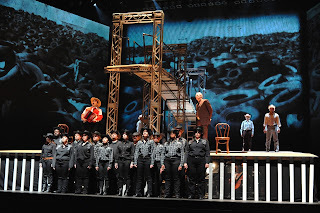 Both productions presented an unconventional staging, a prominence of video, folk and pop music elements incorporated into the score, occasional electroacoustic moments, a hyphenated opera genre (Videopera vs. Hyper-opera), and an apocryphal female lead character. The libretto for Camelia La Tejana was collaged together by the composer's brother, artist Rubén Ortiz Torres, from various media about the main character. With a semi-mythological tabloid character such as Camelia La Tejana, this seems especially appropriate. A collaged libretto is a more accurate portrayal of the media-parsed contemporary consciousness than a singular vision of one writer. The centerpiece of the set design was a square raked stage with a square hole in the middle, raised about 5-6 feet above the stage. The orchestra sat below the raised stage, while a bridge running parallel to the audience's sightline spanned the hole. The bridge would occasionally lift throughout the production. It provided an interesting representation of the Rio Grande/Bravo border, above which the immersive video design could dictate the mood of each scene. Though a clearly innovative confrontation of the problem of scale on such a large stage, this design seemed to provide a conceptual challenge for the director. The performers rarely appeared fully comfortable interacting with the stage, while the bridge raised and lower seemingly at random. On the other hand, the sight of that same set piece was so immediately striking that everyone commented on it as they entered the space. The most ecstatic moment for me was at the finale, when Enivia Mendoza sang Contrabando y Traicion, the song which originated the myth of Camelia La Tejana. Ortiz stripped the song of norteño music's characteristic oompah's, transforming it into a powerfully lush and spacious aria. This moment also finally made good on the dramatic promise of the bridge. Mendoza began the song atop the bridge, which was raised to its highest point. Over the course of the song, the bridge slowly lowered, touching down just as the song ended. It was a simple yet powerful moment. There were also notable performances by Nova Safo, John Matthew Myers, Adam Meza, John Atkins, Maria Cristina Navarro, Susan Kotses, and David A. Blair. Throughout the piece, I imagined I heard some extra low brass, and talking to some of the musicians after the performance confirmed my suspicion. The lowest of brass was provided by tubist Luke Storm, who was uncredited in the program. Being born and raised in Alaska, my knowledge of the rich musical heritage of Mexico feels a bit stunted. I imagine that having grown up with the original Los Tigres Del Norte recording would have added much contextual depth to the piece, as it must have at the 2010 professional premiere in Mexico City. As such, I would love to take another listen through Ortiz's vivid score. Has anyone considered making a recording? 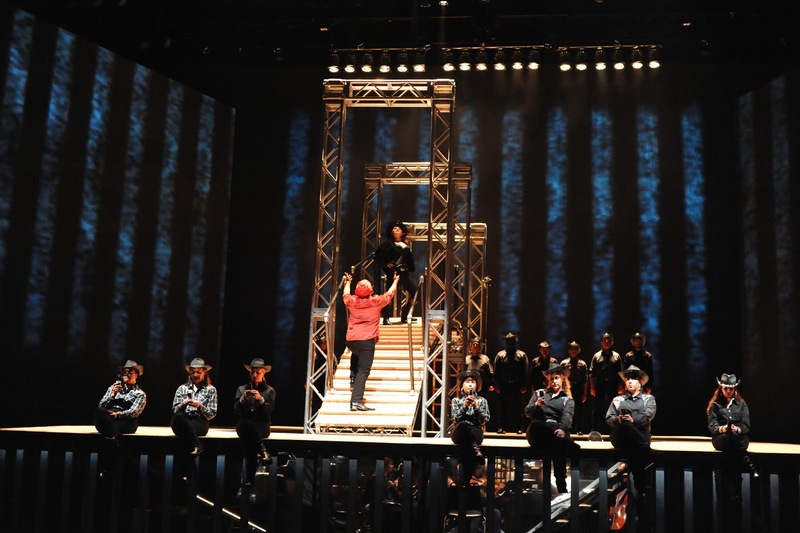 Long Beach Opera's next production is in May - a double-feature of Stewart Copeland's Tell-Tale Heart and Michael Gordon's Van Gogh. 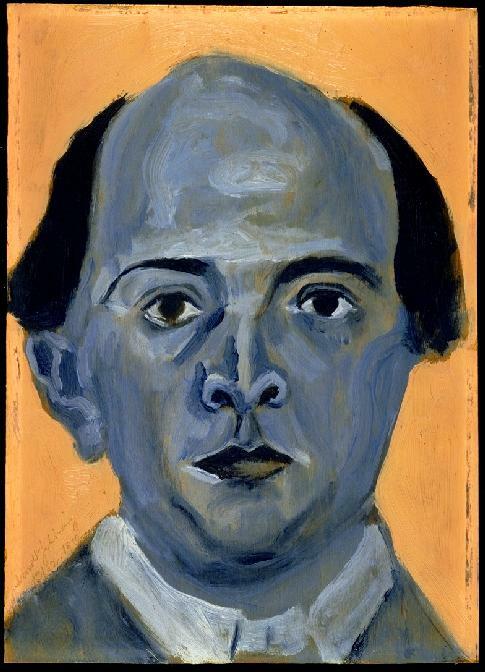 Though Arnold Schoenberg renounced his brief but fruitful pentatonic period, his remaining sketches from that time provide valuable insight into the psychological effect of Germany's larger socioeconomic transformation before the first world war. Musicologists have recently unearthed cylinder recordings from the first reading of his initial sketches for Pierrot Lunaire (Op. 12). Originally titled Pierrot l'Ane, it is a little-known fact that the piece was composed during that discarded pentatonic period. Inspired by the incidental mistakes of the musicians' sight reading, his revised version incorporated the added chromaticism and became the Pierrot Lunaire that we know and love. Schoenberg's development of the dodecaphonic system is well documented, but his transitional pentatonic period is less commonly taught. 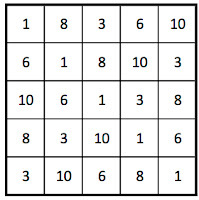 Before settling on all 12 pitch classes as his theoretical harmonic palette, he experimented with other numerical bases. In the same Francophilic spirit that inspired his use of Giraud's poetry, Schoenberg's enthusiasm for Parisian composers like Ravel and Debussy influenced his choice of pan-diatonic pentatonic and heptatonic systems based on the interface of the piano keyboard. 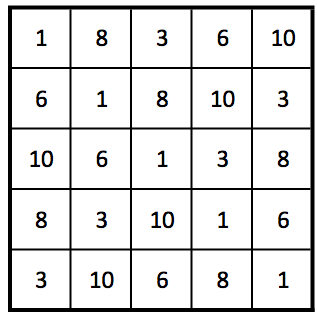 These relatively simple harmonic schema were treated to the same sorts of row transformations that became hallmarks of later serial compositions. For the first time, you can now listen to those original cylinder recordings of Schoenberg's Pierrot l'Ane online! Though the instrumental ensemble is unknown, the singer is Albertine Zehme, who premiered the finished piece at the Choralion-Saal. Schoenberg officially disowned the recordings once the piece was developed into Pierrot Lunaire (Op. 12), but these historically important documents offer a glimpse of the composer's then-nascent iconoclastic musical revolution.